Landscape Photography Mistakes is the second and last part of our previous article – Common Landscape Photography Mistakes. You can read the previous article if you want not to miss the rhythm of reading, although this article can be be read as a standalone article. Just to summarize and recall – we previously talked about spending a good time before taking a shot, orientation of the camera, leveling with spirit meter to keep he horizon parallel. The rest of the points will be discussed in this article – Landscape Photography Mistakes. Many people think that landscape photography will be resolved simply by using a short lens, but it is not the truth. Do not misunderstand, the wide angle lens are fine, but they are not the final answer. Sometimes you may catch too many elements in a scene (in fact we talked about using Wide Angle lens in different purposes too), and this may divert attention from the outcome you want to achieve. If you can bring a better position – great, but it takes time and environmental conditions change quickly, often leading to taking too much risk. Do not be shy with the zoom – there are plenty of great landscape photos taken with 200mm or more. An interesting side effect of shooting at longer focal lengths is that, it flattens the depth, bringing all the elements next to each other. Landscape photography often requires to photograph both the sky and the earth and these two elements are often very different in terms of exposure. The problem is that, if you expose for the sky, the earth might be too dark and if you expose for the land, the sky can be burned and may loss the details. Your goal as a landscape photographer is to make sure that all the elements in the shot are exposed correctly, so that the maximum detail is revealed to the viewer. There are mainly two ways of controlling exposure in this situation, one is using the HDR method and the use of graduated filters. The HDR involves the creation of multiple exposures, it is usually at least 3, and fusing them together using a software. Graduated neutral density filters are a means to control exposure when shooting to try to get a more balanced exposure in the camera rather than in post-production. This is a gold standard since film age. Use a graduated filter is like putting a pair of sunglasses on the camera, but only for the bright side (the sky). In everyday life, the human brain works effectively to remove all the unwanted details from a scene, focusing only on what you want to see, which often are the most attractive. When you are on the beach, watching a beautiful view of the horizon (we hope! ), will not include the papers that someone has left on the sand. You have to self-condition yourself to notice these details, otherwise they may spoil the final result. Always take the necessary time to compose a scene, so as to not show unwanted elements, or when possible, even eliminate them before shooting. If all else fails, you can remove unwanted elements in post-production, which might not be possible at all the times. This Article Has Been Shared 1290 Times! Live Preview in Digital Camera is a system that makes possible to use an inbuilt digital display like an optical viewfinder in real time for capturing a photo. Landscape photography is the art of taking photograph of animate and inanimate environment and closely related to nature and architectural photography. 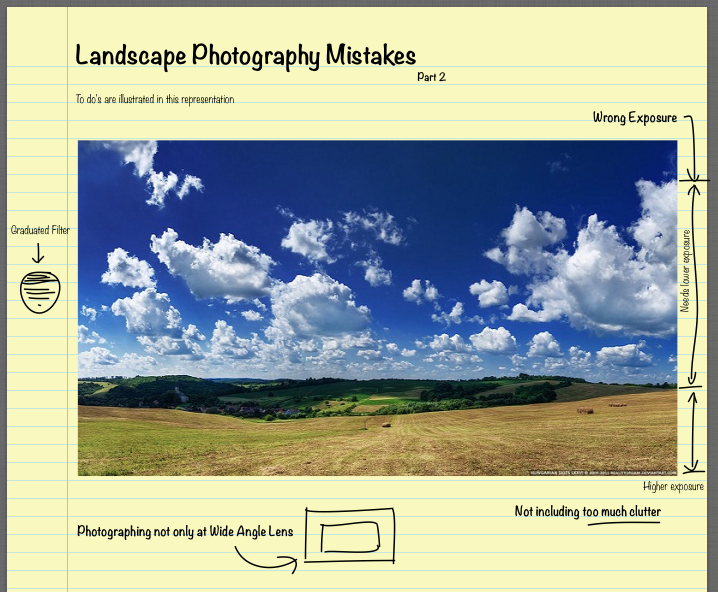 Cite this article as: Abhishek Ghosh, "Landscape Photography Mistakes : Another Points," in The Customize Windows, July 13, 2013, April 21, 2019, https://thecustomizewindows.com/2013/07/landscape-photography-mistakes-another-points/.